SendGrid’s tag line is “Email Delivery. Simplified.” For my needs, however, that pronouncement didn’t resonate much. Having a pretty easy email handler within my Westhost web hosting service, and with MailChimp taking care of my bulk emails, I felt pretty taken care of in the simplification department. But, there was that not-so-little problem of a sizable percentage of my emails not getting to my recipients mailboxes! So, making a long story short, that’s how I ended up becoming a SendGrid client. There are a lot of reasons why an email does not make it to its intended recipient. Sometimes it’s because the receiver had inadvertently added your email address to their junk mail list, or it could be something as menacing as AT&T (or some other email forwarding institution) adding your IP address to a black list—often for no reason whatsoever. Whatever it is that’s holding up your email, it’s not only detrimental to your work and ability to communicate, but resolving the black list or junk mail settings issues can be very difficult and time consuming. In plain English—which, frankly, the communications folks at SendGrid have trouble with—they handle your entire email needs under one plan, affordably and easily. (Or, so I think they’re saying.) Oh, and their starter plan is free. Check out SendGrid at: www.sendgrid.com. 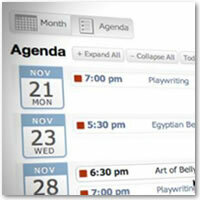 The All-in-One Calendar is one of those plugins that one has to believe was specially developed for event-heavy nonprofits in mind. It easily, and beautifully, allows one to find and share events. Already installed and running on more than 20,000 websites, and translated into 11 languages, the All-in-One Calendar is purportedly one of the most feature-rich calendar systems in the world. We’ve tried it on a couple of our client webs, and we think it’s pretty cool. Go to: http://time.ly to download it for free.